Home » #LadiesOfLondon » #LadiesOfLondon Why I’m Obsessed With Brit Caroline Stanbury, and Why You Should Be Too! Bravo Hit Returns September 10th For Second Season! 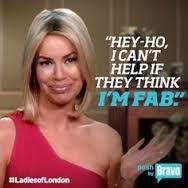 #LadiesOfLondon Why I’m Obsessed With Brit Caroline Stanbury, and Why You Should Be Too! Bravo Hit Returns September 10th For Second Season! I love the British. They have History you can trace thousands of years. The entire UK is steeped in tradition and ceremony that they take very seriously. I’m not saying I don’t love the USA because I do, but when Macy’s stays open on Thanksgiving we need to re-evaluate our country’s priorities stat. In Britain tradition always comes first, and it’s a wonderful culture shock for this American blogger. When Bravo aired “Ladies Of London” in 2014 I was delighted! I could get my fascination fix on for all things British. The cast was a mixture of American transplants to London and true English-born ladies helping the Yanks navigate high society. As I watched the show (several times over) I fell in love with Caroline Stanbury and Annabelle Neilson. These are the cool girls that Regina George wishes she had on speed dial. To celebrate season 2’s premiere of “Ladies Of London” I feel that getting the audience better acquainted with the dynamic duo is in order! My first profile is of Caroline, enjoy! London “It” girl and star of Bravo TV’s “Ladies Of London” Caroline Stanbury is a force of nature. Her entrance into ‘society’ was as a 17-year-old at the Berkeley Dress Show, which was then the opening act of the London season.Her mother Elizabeth is a descendant of the Vestey dynasty which gave Caroline the required rank to lead a well-connected existence of parties, polo matches, and A-list events. In her 20’s Caroline had high-profile relationships splashed across UK tabloids that were fascinated by the blue blooded party girl. All of the chatter quieted down when Stanbury met Turkish financier Cemin Habib in 2003 and married in 2004. 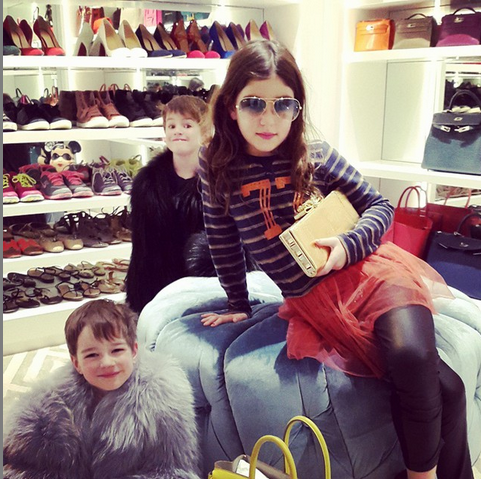 Cem and Caroline have 3 gorgeous children daughter Yasmine, eight, and four-year-old twin sons, Zack and Aaron. Yasmine has recently been signed to a London modeling agency and rumored to be the face of an upcoming Cavalli campaign! Gorgeous family Habib’s. 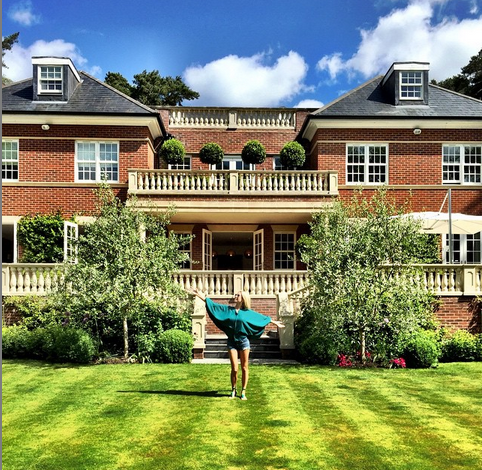 Speaking of gorgeous, this family lives on the exclusive Wentworth estate in Surrey,UK. Caroline’s $10M home includes her amazing closet, which looks more like a luxury shop with her collection of designer apparel. 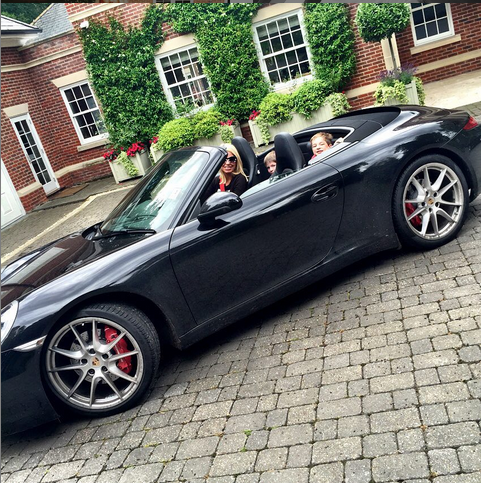 Caroline does have a very expensive addiction that she refuses to get professional help for….. The blonde beauty is addicted to Luxury Handbags! Housed in a custom-made walk-in wardrobe with full-length mirrors, velvet-lined window seats, Venetian glass dressers and cashmere-soft cream carpets, are at least 25 bags by Hermes and Chanel.Caroline is understandably shy of pricing the collection, but it is not unreasonable to guess they are worth a cool £200,000; the basic cost of a Birkin is £5,000.She even has two Hermes Kelly 28cm bags, which could cost anything up to £25,000. If this is an addiction where can I catch it? Please send any castoffs you have decided to part with, I’ll make sure they are put to good use! I left school at 18 and went straight to work, first as a stylist and then as a personal shopper. After gaining years of experience in the retail industry, and having built up a large and loyal clientele list and personal connections with designers and artisans across the globe, I realized there was a huge gap in the market for online luxury gifting. I launched Gift-Library.com in 2008, and haven’t looked back since. Being self-taught, the entire experience has been a real learning curve for me, but I’m so proud of what has been achieved and how much the business has grown in the past five years that I wouldn’t change a thing. Caroline’s luxury online gifting website “The Gift Library of Caroline Stanbury” was recently sold to rival company Amara. The transaction included the domain name and no other assets. Traffic to the Gift-Library.com web site is now diverting to Amara.com. In 2013 Caroline Stanbury acquired “The Wedding Shop” which is a natural fit with “The Gift Library.” It is unclear if Wedding Shop was also part of the buyout. While no other information is available about the sale of Caroline’s business, I’m guessing the savvy blonde is on to bigger and better things! More details are sure to follow when #LadiesOfLondon returns in August and we hear from Lady Luxe herself. Update: Bravo Confirmed New Episodes Begin on 9/10/15 at 10pm. Season 1 is available at BravoTV On Demand. New scenes have been added to original episodes and promos for season 2 run in lieu of commercials! 2 Comments on #LadiesOfLondon Why I’m Obsessed With Brit Caroline Stanbury, and Why You Should Be Too! Bravo Hit Returns September 10th For Second Season! I looooooooooooooove Caroline too! I also think her husband is adorable, but don’t tell her or my husband, lol! I can’t wait for this season to air! Her husband is ADORBS!! I love this show. It’s fun and light like HW’s were ages ago….